Our Zoolock deck list guide for the Rise of Shadows expansion will teach you how to play this explosive Warlock list. This guide includes Mulligans, Gameplay Strategy, Card Substitutions, and Combos/Synergies! Zoo Warlock is one of the true evergreen archetypes of Hearthstone, having seen play since the Classic days in some form basically throughout the game’s entire history. 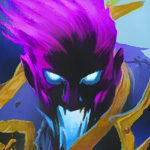 While the specific synergies change from rotation to rotation, the core goal of Zoo is to leverage the Warlock class’ premium one-drops (like Flame Imp and Voidwalker) to quickly get on the board, then abuse the Life Tap hero power and the low mana curve to basically play two cards every turn in the later stages of the game. The end of the Year of the Raven also meant that the heal-based version is no longer an option, but a token-based approach with some interesting surprises makes Zoo one of the stronger contenders in early Rise of Shadows meta. 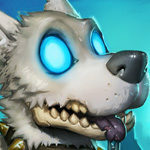 With Doomguard moving to the Hall of Fame, the currently popular versions run absolutely no burst from hand, which means Zoo once again plays essentially as a control deck in most matchups, removing all threats as the game progresses and dealing damage with its excess minions on the board. Thankfully, you’re well-equipped to create a massive board with cards like Scarab Egg, EVIL Genius and Grim Rally. 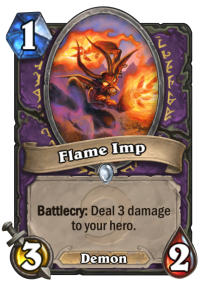 Flame Imp – The highest stats for a one-drop with the lowest downside available to you, it’s a must-keep in every matchup. However, keep in mind that a Backstab can really ruin your day against Rogues, therefore consider keeping an additional one-drop or two in your starting hand in these matchups. 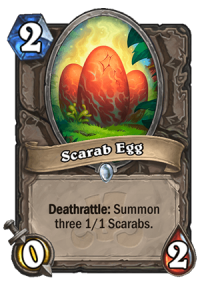 Scarab Egg – Most of your synergies revolve around popping this bad boy in some capacity, therefore you should keep it even when going first. You will easily recoup the tempo loss. 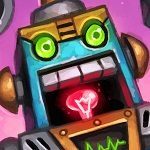 EVIL Genius – Beyond the egg, any 1/1 token is a juicy target for consumption and the lackeys are fantastic tempo options early on. Magic Carpet – For a deck that lives and dies based on its board control, Rush is basically as good as Charge. If you’re ahead, it gives you a welcome attack buff – and if you’re behind, it’s your one lifeline to fight back. Other one-drops – While Flame Imp is the apex predator, you definitely want to hold on to at least one in every case to guarantee a turn one play. If you have Magic Carpet in hand, keep as many as you can – just like with Scarab Egg, it will repay the tempo debt with interest. Keep two if you’re on the coin. 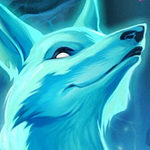 Knife Juggler and Dire Wolf Alpha – Both of these cards get exponentially better when you have a wide board and are understatted otherwise: Juggler is a better keep if you expect to be ahead on the board early on, while Dire Wolf Alpha can help you in aggro mirrors if you want to squeeze out better trades from your one-attack minions early one. Still, they’re only worth keeping if you’ve otherwise got the tools needed for your gameplan. Grim Rally – Similarly to the cards above, it’s only worth keeping in specific situations when you can already see your first few turns and feel like you’re guaranteed to have a wide board to leverage. Arch-Villain Rafaam – Since this is your main win condition against Warriors, you want to slam it down as soon as possible. The key to increasing your winrate in aggro mirrors with Zoo is to figure out whether you’re supposed to play for board control at any given time. Since this particular version of the archetype has absolutely no burn available to it and thrives upon buffing wide boards, your goal is always going to be to find value trades and control the board. This will also allow you to Life Tap more often without risking death, since you’re limiting your opponent’s opportunities to deal minion damage to you. So how do you establish an early board lead? By maximizing your chance of value trades. 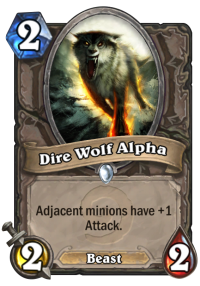 This is done by finding the most possible extra damage points with Knife Juggler and Dire Wolf Alpha, making play order and minion placement critical. 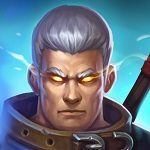 It’s more than worth sacrificing a lot of resources in order to stay ahead on the board – even to the extent of playing an Abusive Sergeant for tempo if needed –, since it’s easy to refill with Life Tap. Unless you feel like you’re going to lose in the next few turns, always prioritize value trades over face damage. Your one source of initiative is Magic Carpet, and it’s enough to single-handedly help you recover the board. It’s worth coining it out instead of other higher-initiative plays because of its high health, and once you’ve regained the tempo with the Rush buff, even the simple +1 attack can be a game-changing benefit in the long run. If you feel like you’re falling behind but you have a Magic Carpet in your hand, make sure to hold back your one-drops until you can cast them alongside it. Since you have no direct damage, your base strategy is fairly similar, but with a few notable exceptions. 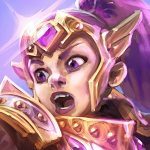 You want to push as much damage in the early turns as possible, then only make key trades against minions whose ability could potentially be detrimental to you – otherwise you’d simply be missing out on face damage. 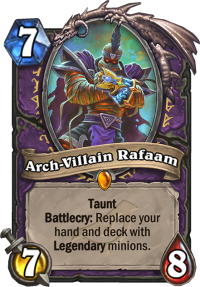 Of course, heavy removal-based decks like Control Warrior and Freeze Mage are really bad matchups for your general gameplan – this is why Arch-Villain Rafaam is included as an X-factor. Much like Prince Liam in the post-nerf Odd Paladin builds, it gives you a very credible path to victory in the late game. Just keep in mind you’re still the aggressor: the ideal situation is that the opponent has to exhaust their removals on your newfound legendaries, which lets you push in the remaining damage you haven’t yet delivered with your little critters. 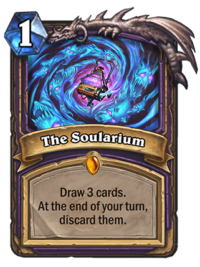 If you draw three cards with The Soularium before playing Arch-Villain Rafaam, you won’t discard the transformed cards at the end of the turn. Sometimes you’ll encounter situations where you really want to pop your Scarab Egg but your opponent only has one-attack minions on the board. You can use your Abusive Sergeants to give their minion a temporary buff before trading into it. Using Grim Rally on a Scarab Egg will not buff the three 1/1 minions that spawn from it. If you can reduce your Sea Giant’s cost to exactly one, it will get the buff from Magic Carpet. You really don’t want to mess with either the quantity of the quality of the one-drops in this deck, but certain tools on the higher end could be adjusted depending on the opponents you’re facing and the cards available to you in your collection. While the specific effects of The Soularium and Arch-Villain Rafaam – the two most expensive cards in an otherwise fairly cheap archetype – can’t be replicated, you do have some reasonable alternatives. Weapon removal in the form of Acidic Swamp Ooze is a reasonable option, and so is a Witch's Cauldron if you feel like you need more initiative. While the current metagame doesn’t warrant it, this Zoo Warlock build is uniquely good for Demonbolt, a card which has an excellent track record in Arena – however, you don’t exactly need undercosted hard removal in the current metagame, but it’s a very reasonable option if the number of midrange decks were to increase. Certain players consider the second Sea Giant a potential swap, but it’s so effective simply off the back of your own minions that it’s tough to find a card that improves your winrate compared to it. Leeroy Jenkins is not recommended: it’s incredibly rare to run into a situation where you almost finish your opponent off before losing the board for good with this kind of a build, rendering it useless as a miracle play. I appreciate the guide and attempt, but the most successful lists do run the burst variant in 2 soulfires and Leeroy Jenkins. The debate on whether or not carpet or non carpet variants is still up in the air, too. Rafaam is definitely not necessary and is more of a hindrance than anything. I would go for a tech card like ooze or crazed alchemist now. Also, saronites are more a liability than anything and more and more lists are cutting it in favour for the cards I’ve indicated above. I run a non-carpet variant and I posted it on competitive hs reddit and many people have made legend with it and myself at 50 legend thus far. I’d honestly say that there is no “direct” replacement, since the card is very unique in its role. No single card will accomplish the same (give you a late game game plan vs slow decks). So you probably should replace it with something that boosts your main game plan. I’d say that Leeroy would be the best replacement, but if you don’t have it, you can actually try Eager Underling. I think the card is a bit underrated, it’s been working better than I’ve expected. Edit : The list i showed but some People Play it without Rafaam. Don’t really see big difference in the update. Still looks like the inferior version of Zoo. 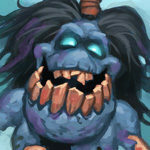 The highest win percentage Zoo decks don’t run the 2x Doomguards, 2x Soul Infusion, 2x Doubling Imp, and The Soularium. Instead they run 2x Despicable Dreadlord, 2x Tar Creeper, Leeroy Jenkins, +1 Spellbreaker, and +1 Lifedrinker. I agree that 2x despicable are better than doomguards but the soul infusion + doubling imp package is rly strong.The soularium is a rly good card and i think should be played in every zoo warlock so i reccomend u try that instead of the tar creepers which cant be aggresive at all. i tried this version for a good 2 months and have a much better win rate with my version without the imps and soul infusion. its more consistent without imps and soul infusion. I’m personnaly not a big fan of the Doomguard in the “heal version of the zoo” and I start to see them playing Mossy to counter Glingling inventor and spreading plague. I can’t image this deck without Despicable Dreadlord! It’s auto-win against Odd Paladins and many aggro decks. Soularium sounds great but it’s not so much necessary. The reason is, this deck is great; many games end in Round 5-6, maybe 7. Sure, it adds extra fuel in mid-late game but at that point, you should have finished your opponent already since this deck has no power to stay late in game. So instead of Soularium, I run Dreadlord in this deck. 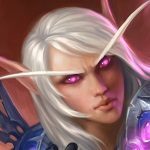 Isn’t Leeroy a good replacement for Doomguard ? I suggest running 1 Doomguard + 1 Leeroy. Any advice on when to play Soularium? I’m always afraid to play it until I have at least 8 mana. Do you just play it when you’re low on cards? My previous comment was posted prior to the deck guide being updated. The guide now answers my question. Thanks! This deck is so cancer. played 6 hours today at rank 3. 90% of time i faced this deck. its so broken. i dont understand why blizz is always pushing this op class which has already the best hero power of the game…. How about -1 doomguard +1 Omega Agent? Seems to work fine if the match lasts too much, especially against control. Too slow for this deck maybe? I think the deck got updated for Boomsday, but the guide hasn’t. This happens a lot after a new expansion. That’s true. 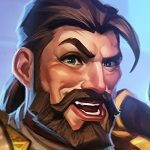 We’re trying to do it as fast as we can, but with with limited number of writers and LOTS of things to do, it takes us roughly 1-2 weeks to get all of the guides updates to reflect the new expansion (depending on how many decks are played, and it seems that there are lots of them now in Boomsday). 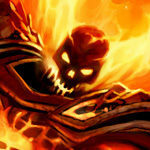 I can’t imagine all of the hours everyone on Hearthstone Top Decks puts in. I certainly appreciate all of the hard work the staff puts in. 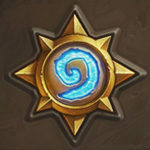 This is my go-to Hearthstone site. is this deck better with or without dreadlord?? It’s still hard to say. Some builds run it, some don’t. It will depend solely on how the meta shapes out.